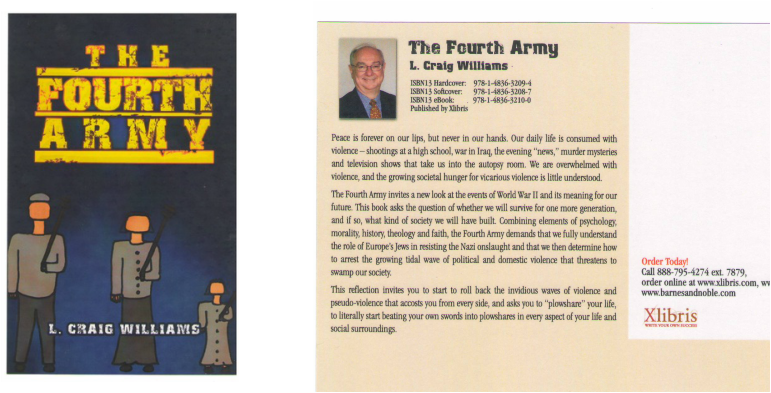 Excerpts from The Fourth Army can be accessed on Xlibris.com, and many of the core values stated on this website receive wider treatment in the pages of the book. The Fourth Army (TFA) focuses on the Shoah and offers new insights about that terrible event in man's history. But TFA is more than another examination of the Shoah. It is a call to recognize the growing violence around us and to begin to stop violence. You will see in these pages a constant struggle with individual violence and a call to "plowshare our lives" by recognizing, then taming the common violence that infects our amusements in sports, television, and almost all aspects of how we live.